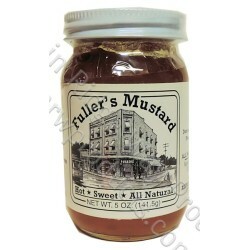 Fuller's Hot & Sweet Mustard - 5 Oz. Net. Wt. Hot and Sweet! What a perfect combination. Get the hot spicy flavor of mustard combined with pure cane sugar that gives your mouth a real treat. Great as a sandwich spread, brushed on pork as a finishing glaze or use to make a tasty vinaigrette.